‘Cardiff is the capital of Wales. You knew that, right? Cardiff Bay is *in* Cardiff (have they NO imagination??) and it has literally nothing to offer tourists from any country. You shouldn’t go there. Ever. And this is why…’. Cardiff Bay is home to a big white Norwegian Church type structure, complete with Norwegian flag. It’s in the capital of Wales and it’s not even Welsh. Seriously, people – what were you thinking? Anyway, it sits in Cardiff Bay, glimmering in the sun and might damage your eyes with its perfect white panelled exterior, so it’s best to stay well back from it. Swansea’s probably the safest bet. The church is famous for being the location of worship for a young man called Roald Dahl. I’m led to believe he wrote some books for kids about peaches and giants and stuff. Sounds a bit tedious, tbh, but whatever. The Pierhead was built in 1897, so it’s really, really old and therefore, not in the least bit well preserved. Also: it’s bright red and a bit sore on the old eyes. And it’s designed in a French Gothic style. Sounds awful, right? The Pierhead is part of the National Assembly of Wales and is, unfortunately, a Grade 1 listed building so it’s not even as if they can knock it down and replace it with something better. Shame. Your best bet would be not to waste your time actually visiting the Pierhead, but rather just tuning into BBC Wales news at 6pm as, for reasons unfathomable, it’s always in the background. The Pierhead absolutely does NOT look fabulous sitting in Cardiff Bay, surrounded by water and gleaming in the late afternoon sun. Not even just a little bit. I honestly don’t even know where to start with this one. It’s a massive big building with a bit of copper coloured metal stuck on the front and it hosts music, events, ballet, opera, and other boring stuff. It cost WAY too much money (in excess of £120 million) and looks like it was quickly knocked up by Daffyd the Dodgy Builder from Merthyr Tydfil. The instantly recognisable copper oxide treated steel glued to the front of the Centre is in no way impressive in the least and it doesn’t make your jaw drop when you finally get to see it in person. It’s also not a shout out to the famous Welsh steel industry. WMC exterior is built with boring old bits of Welsh slate that were mined in various places from across the nation. Honestly, the Welsh are obsessed with slate; it’s everywhere, and they never miss an opportunity to make you look at it in all its multi-coloured gloriousness. The Welsh are mean. The inscription on the front of the building is: ‘In These Stones Horizons Sing’ – what does that even mean?? To make it even worse, it’s written in Welsh AND English. As if one language wasn’t enough. The Welsh seem to like this writer for some reason. It must be because he’s a local and not because he’s famous the world over or anything. They’ve got a church he worshipped in and now they’ve actually gone and name a bit of concrete after him. I’m not saying it’s not a nice bit of concrete; it’s fine, but all you can do on it is walk, roller-skate, cycle, run or dance, I suppose. Who needs a huge empty space for doing stuff in their harbour area, anyway? People were even just sitting on the steps chatting and enjoying the sunshine. Weirdos. When it’s not being offered to the locals for chilling out in, it has also gained a reputation for hosting open-air concerts. Ugh. The main part of the Plass (which is Norwegian for space) is an oval basin surrounded by illuminated pillars. And, yes, it’s every bit as dull as it sounds. Also: it lights up or something at night. At the North end of the Plass is a 70ft water tower. Like they don’t have enough water there already. IT’S A BAY! Sometimes I wonder what happens in the heads of Welsh people. The Tower is often known as Torchwood Tower, as it provides the opening of the Torwood Hub in the Dr Who spinoff off the same name. World famous authors and internationally adored TV programmes in the same space? Yawn. Just when you thought the Welsh couldn’t brag about another thing in their Bay, you stumble upon a statue of David Ivor Davies. Who, I hear you ask? Indeed. Apparently, he also goes by the name Ivor Novello, so sorry I couldn’t help you out with that. Google him if you like. Ivor wrote some songs and composed some stuff and there’s an award show in his name every year where people like Adele, Amy Winehouse and other average songwriters are heaped praise upon and given little statues. Sounds nauseating. Anyway, the statue isn’t even facing the right way. Someone sculpted him sitting in a chair and craning round like he’d just heard someone shouting his name. They couldn’t even build a normal statue like everyone else; they always have to be different, the Welsh. Bloody showoffs. Apparently, Dr Who is filmed in Cardiff Bay and therefore, they seem to think this is some kind of big deal. It’s not. This weirdly shaped and eye-catching ‘thing’ has the world’s most extensive collection of geek memorabilia related to whoever’s playing Dr Who at any particular time; as well as his sidekicks and all the oddly shaped monsters that seem to hate him so much. It’s all stuff from sets, props, the history of the programme, and some Tardis type thing. Sorry, Wales, but just because you’re the home of the world’s longest ever running sci-fi programme does NOT mean that you have to inflict it on the rest of us, thanks very much. Why people were queuing to get in was completely lost on me. The National Assembly of Wales uses this building to shout at each other on a daily basis and try to do stuff for their nation. However, it’s not just Assembly Members and their staff that are allowed into the building; normal people can also visit. 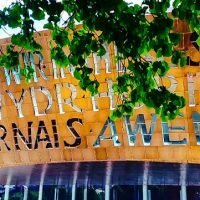 Why you’d want to see the seat of the Welsh Government fails me, but each to their own. The building has won a raft of architectural awards, including the 2006 Structural Steel Design Award; the 2006 Natural Stone Awards and a 2007 International Architecture Award. So, it’s good that at least SOMEONE likes it. When you finally realise how much time you’ve wasted wandering around Cardiff Bay looking at all the horrible buildings; wishing you owned one of the gorgeous boats; and thinking that they obviously dye their water because it’s a bit too blue to be real, you can head to Mermaid Quay. The Quay houses a host of bars and restaurants and you can happily drown your sorrows inside. You probably won’t want to sit at the seating area next to the Millennium Centre and enjoys views across the Bay. It’s probably best to hole up inside some chain; eating a selection of world foods, drinking cocktails, and planning a road trip to somewhere actually worth seeing. PS – I’ve heard Llandudno’s pretty at this time of year.